A few months ago, I had the honor of being invited to a chicken farmer’s operation, to document and report on what it’s like on slaughter day. This is a big honor, as American farmers and the American media don’t necessarily have a good history together. Despite that, Jason Lingo was trusting me to come into his home, watch him from sun up on a slaughter day, and then to tell his story to the public. And what’s more, he was letting me bring my videographer husband. 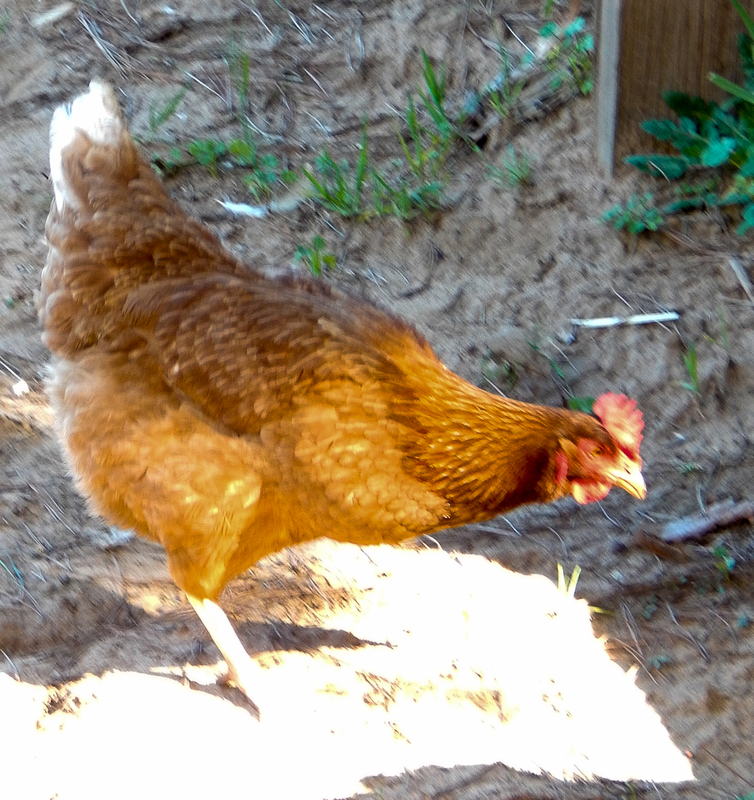 The day we visited his organic chicken ranch in San Benito County, it was a holiday. His wife was off from her off-the-ranch job, and his young sons were home. Jason was kind and let us show up late in the morning – 7am. 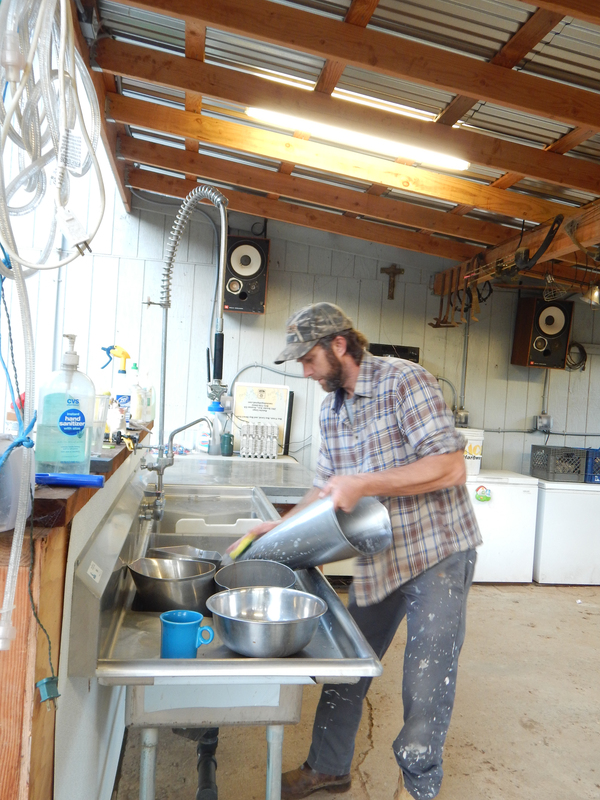 He was already pretty well into his day when we arrived; the early morning chores were done and he was doing the first round of cleaning in his small processing area. His wife came out shortly after we arrived, with a bright smile and plates of breakfast for all of us. (Boy, do I love farm hospitality!) She also had a couple of the sweetest little boys toddling around after her. 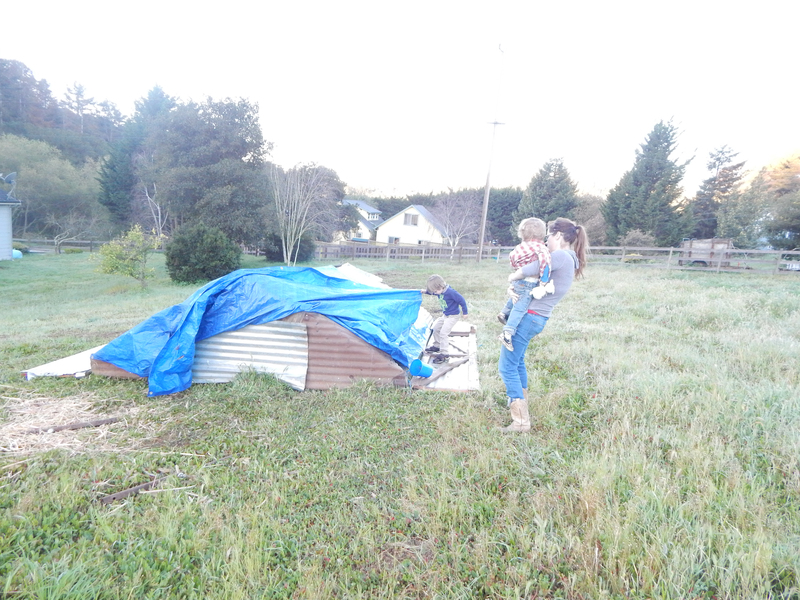 She took the boys and had them “help” her uncover one of the chicken coops. Actually, it wasn’t shoddy at all. Repurposing things is very popular right now. He could probably sell some of his “repurposed” chicken coops for a pretty penny on Etsy. While uncovering the chickens, the eldest son noticed one of the cows was stuck in some wire fencing. 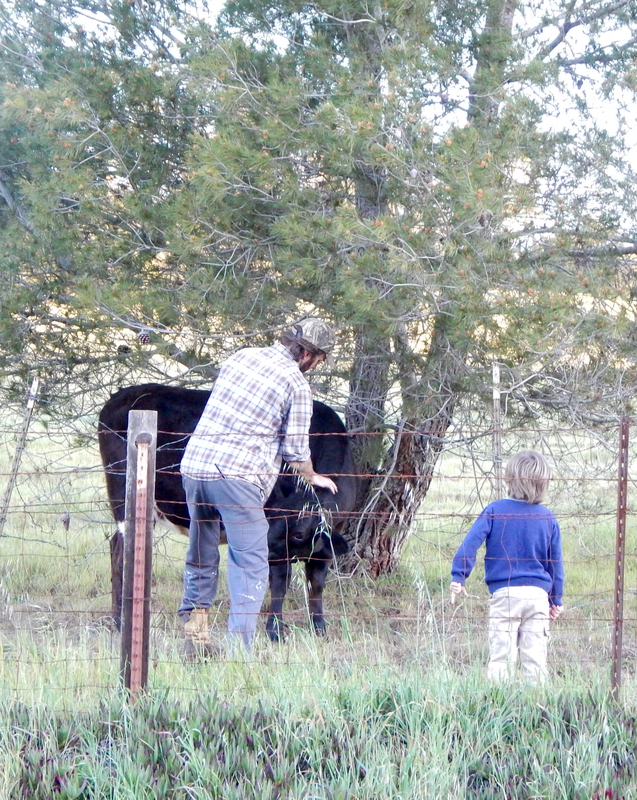 Everything stopped so father and son could go get the cow free. I loved watching them work together to get the cow out, the son mirroring his father as he asked the cow why she got stuck again. Soon, all attention was turned on the chickens. 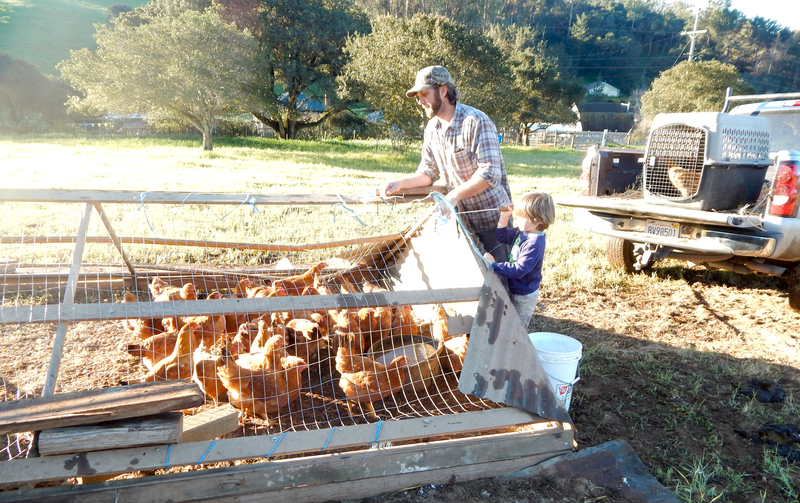 Jason explained his rotation process, moving the chickens frequently so they would always have fresh grass. He talked about how he tries to teach his sons to be kind to the chickens, “not that I’m a hippy or anything. You just don’t want to scare them before the slaughter. There’s no reason to, and you’ll taste it in the meat,” he told us. He teaches his boys to respect the birds, and says even though they’re just chickens, they are the basis of his business. Finally, it was time for the one thing we were going to do that morning that really had me nervous: slaughter. Sidebar: I’m not a farmer. I wasn’t raised in farming. I was raised AROUND farming, which is different. I have a great love for agriculture, respect for farmers of all kinds, and love helping to share their stories and true facts about agriculture. But, I’ve never seen a slaughter. And I’m not that good with blood. I had reason to worry. Jason’s operation is incredibly clean. 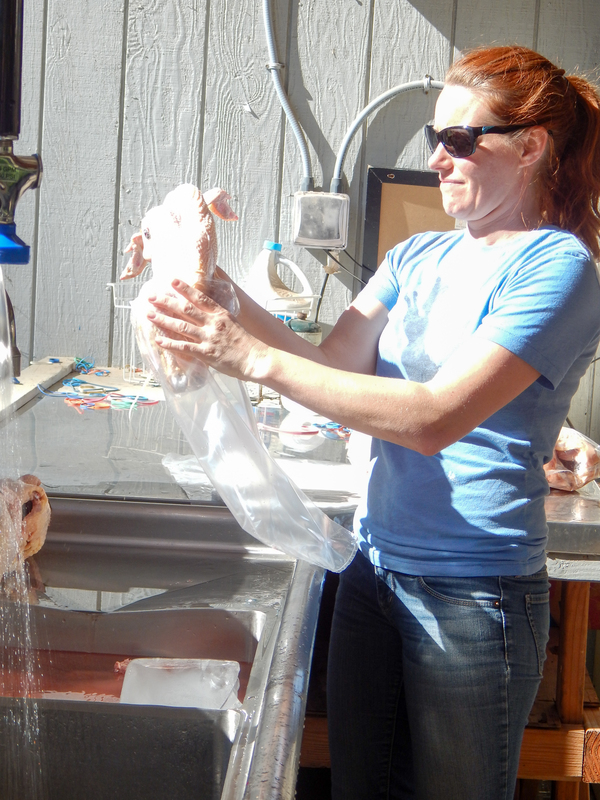 The process of actually killing the chicken was very fast and not gory. I wasn’t bothered by any of it. And if afterward he had fried up one of those birds, I’d happily shared it with him. 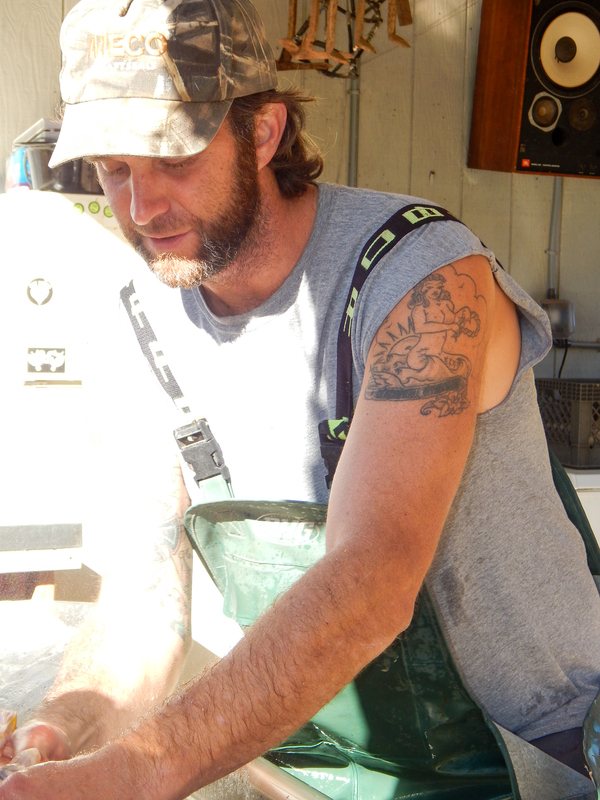 Jason’s sister came out, as she often does on slaughter days, and helped him process the birds. They processed about 25 birds that day, many of which were already claimed by Jason’s faithful customers. He slaughters each Monday, then takes the birds that evening to the farmer’s market in Pacific Grove. He sells out every week. So, that is just part of Jason’s story. It’s taken me months to even share that much. I promised Jason I would be careful with his story. He’s very aware of the problems livestock producers can have when they share their story. But, he’s also very kind-hearted, and doesn’t want to offend anyone. You know what? I think he’s right.